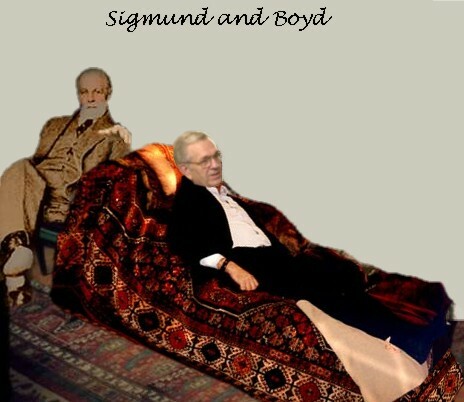 Add your own captions to "Sigmund and Boyd" in the text box below. Sigmund: My initial diagnosis indicates deep melancholia. Sigmund: Tell me about your childhood. Boyd: I remember sitting in the Tabernacle. I used to love gazing at the large organ. It's multitude of long hard pipes filled me with a strange mix of emotions that as a child I didn't understand. It is the same feeling I get when looking upon the massive spires of our temples which shoot skyward attracting the gaze of all around. Siggy: Tell me about your mother. Boyd: I liked to play with my sister's Barbie dolls. One time I put Ken and G.I. Joe in the same tent.